A family friend gifted this book to me. He knows that WMMGA is working on the topic of pesticides for our website. He thought that a book that declares itself to contain “all you need to know about the insects in your garden” would be of interest. He is so right, particularly because this book not only details some of the most destructive insects, but also the good ones we will want to nurture. Did you know that only 10% of the world’s trillions of insects are ‘bad’? That means the remaining 90% are not bad, and most likely are ‘good’. When we use pesticides (insecticides, herbicides, and fungicides) in our gardens, these poisons are affecting the life cycle of the beneficial insects more so than those of the non-beneficials. Let’s find another way to control and eliminate these specific problem insects and not the good visitors to our gardens. The introduction is filled with great information, even for the seasoned gardener. Jessica Walliser also has a global warning for gardeners regarding climate change and what that is bringing to the insect world. As the subtitle suggests, she advocates for an organic approach to problems in the garden. How to eliminate a problem insect? First, identify the specific insect. Once we know what it is, we can develop our plan of elimination. This is where Good Bug Bad Bug will assist us. The main portion of the book presents fact-filled profiles of 27 of the most common and destructive gardens pests. This includes photos of the adult insect, larval stages, and the destruction on a plant for easy identification. There is a list of the plants these bad guys like. She then gives us biological controls, preventative actions, and a list of organic product controls that may help. She then does the same for 14 of the most beneficial insects including photos of the adults, the eggs and larva so we don’t mistakenly eliminate the good bugs. This hand-sized book (6 inches by 7 inches) has a thick cover with a heavy binding and thick glossy pages, so we can take this book out into the garden to identify the insects on our plants and not destroy this reference. OK, I’m ready to find them, both the good ones and the bad ones. Here I come. 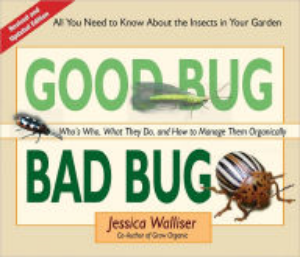 About the author: Jessica Walliser is a horticulturalist and co-host of the radio show “The Organic Gardeners” on KDKA Radio in Pittsburgh, Pennsylvania. She writes a weekly gardening column, “The Good Earth” for the Pittsburgh Tribune-Review. She is also co-author of Grow Organic and A Gardener’s Journal.